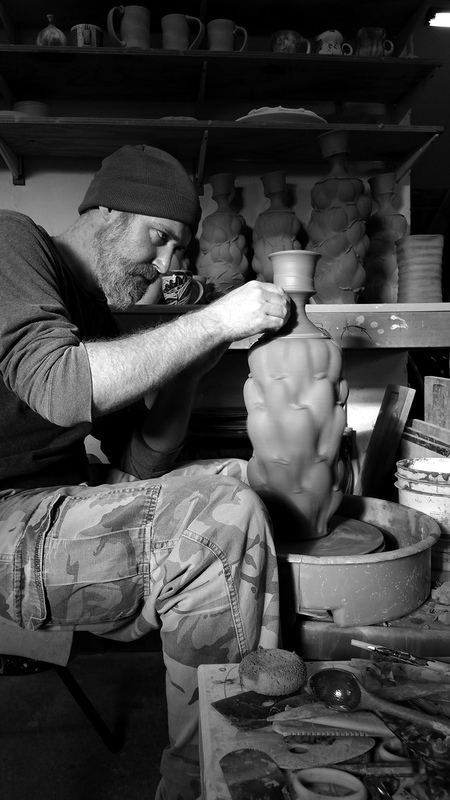 In the current issue, Eric Botbyl contributed the article, "Have Pots, Will Travel" about his first experience as a guest artist for the Michiana Pottery Tour. An introvert at heart, I spent years in solitude, head down, steadily working at the wheel. When I reflect on the course my life has taken over the past few years and the opportunities I’ve been given, so much has stemmed from simply packing up and going somewhere. That Botbyl is an introvert is debatable, as his accomplishments would prove otherwise; he has a flourishing studio and gallery in Humboldt, Tennessee, an eloquent writing style, and is an avid mentor to young potters. We are pleased to publish another contribution by Botbyl in the upcoming issue titled, "Developing Voice and Vision: A Studio Internship Model," with accompanying essays by Botbyl's recent interns, Kelsey Nagy and Andrew Clark. Knowing [my interns] has helped me ask measured questions, which I hope has kept them thinking as they work. The exchange is reciprocal; I ask for their thoughts on how my work could improve, and cherish their insights. Both of the above issues of Studio Potter journal provide rich dialogues on the joys and challenges of being a potter - a lifelong learning experience. To get both issues, become a member now and start your subscription with the current issue.